Many behavioural problems can be prevented if puppies are given the opportunity early on (before 16 weeks) to learn social skills, communication and basic manners. At Clever Dog Company we only use kind, fair and reward based methods that are effective in these fields. The specific method we use is ‘clicker’ training. This is a small plastic box with a metal tongue that when depressed makes a clicking sound. 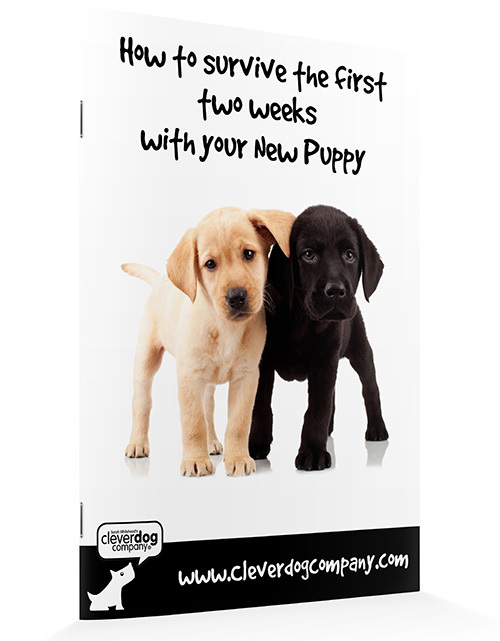 By introducing the clicker to the puppy correctly, it will very quickly understand that the ‘click’ means he has done the right thing, and a tasty treat is to follow! Clickers have revolutionized not only dog training but the training of other animals, such as dolphins, as well. By coming to a puppy class you will be able to allow your puppy to socialise in a controlled and positive way, allowing your puppy to meet other men, women, children, and other puppies of different sizes and shapes! This is so important for producing a well-adjusted and outgoing adult dog. Leaving it any later than this may well lead to problems in the future. Clever Dog Company ensures that classes are comfortable and non-threatening, thereby ensuring that the puppy is enjoying itself. And puppies love to learn! You will be given a DVD at the start which accompanies the course, enabling you to refer to the class content at any time. The upper age limit for our puppy classes is 18 weeks, and although no lower age limit is set, it is usually dependent on the puppy’s vaccination course. Well-run puppy classes are vital for the development of your puppy, and is the very first step in developing a happy, well-adjusted, out-going adult dog. However, you should also have fun! At Clever Dog Company we do everything we can to make sure this happens! Many behavioural problems can be prevented with early socialisation and training. We use the most modern methods of training. These are kind, effective & reward-based. Clicker training will revolutionise the way you look at dog training. Our classes are about both you and your puppy having FUN! Our Beginners’ classes are aimed at any dog over the age of 18 weeks which has not had any previous training. We assess all dogs as part of the course, to enable us to offer to you the most appropriate help in a comfortable, non-threatening environment. No walking round in circles, no shouting, no force and no embarrassment! The Beginners’ Class is designed to help in all areas of dog ownership. Grooming, handling, walking on a loose lead without pulling, coming when called and mixing happily with other dogs and people are all covered. High instructor to dog ratio. No more than eight dogs in any class. We watch the dogs closely for signs of stress. If necessary we will offer alternative help instead. Our classes are about both you and your dog having FUN! Look at our training section to find out if there is an Clever Dog Company class near you. See the Clever Dog Company Shop for “The Motivation Movie” by Joanna Hill. For inspirational ideas on obedience training using the most modern motivational techniques.